Wash, peel, and core the apples. Then cut them into small chunks. Heat the ghee or vegetable oil in a saucepan. When it begins to smoke, drop in the ginger, cinnamon sticks, anise seeds, chilies, and cloves. Stir fry until the anise seeds darken (about 30 seconds). 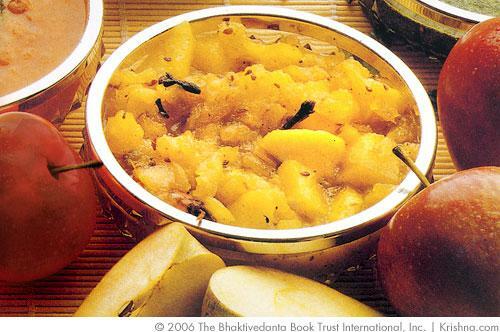 Immediately add the turmeric and asafetida, then the chunks of apple. Stir fry to brown the apples for 5 or 6 minutes, then add the water. Cover and cook over high heat for about 15 minutes, stirring often, until the apples are quite soft. Mash the apples in the pot. Add the sugar, increase the heat, and stir continuously until the chutney thickens. Remove the cinnamon stick and cloves. Serve at room temperature with hot puris or with a sweet at the end of the meal.